Stinging nettle beer can be an aquired taste, but knowing how high in nutrients this is makes home brewing well worth the time. Before hops were widely used in the 17th century all sorts of plants were used to make beer including nettles. 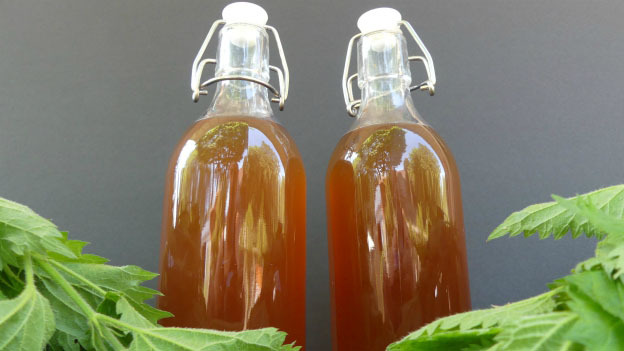 Not only is nettle beer inexpensive to make, it is believed to help alleviate rheumatic pain, gout and asthma. Boil nettle leaves (and dandelion root (or) ginger root) in 4 litres of water for 30 minutes. Strain off the nettles (squeeze excess liquid) and save the liquid. Add lemon and orange juice, brown sugar and cream of tartar to the liquid. Pour mixture into a sterile container (fermenter) with lid. Sprinkle yeast into 1/2 cup of boiled water that has cooled down and wait for it to sink. Gently stir yeast and gently pour evenly into fermenter. Place lid on fermentation pail and wait 3-5days, or until foam has collapsed. For proper fermentation keep beer at a constant temperature between 20-27°C.